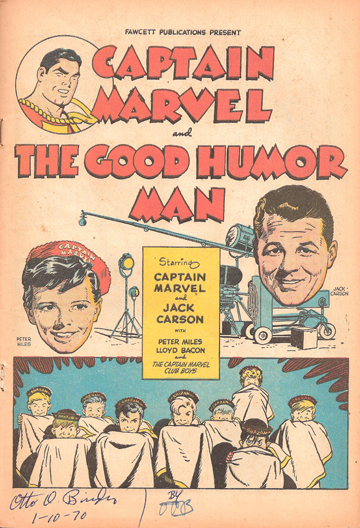 I try to keep an eye out for Turner Classic Movies' broadcasts of The Good Humor Man so I can remind comic-book fans that this is a farce that, oddly, involves comic books. 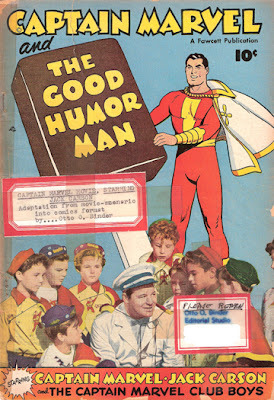 Though many of the brief summaries you'll find online and in reference books fail to note it, the existence of Fawcett's Captain Marvel comic books is a sort of subplot. 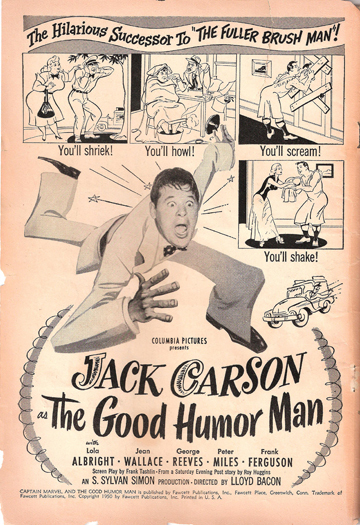 For example, Leonard Maltin gives the 1950 film (79 minutes) two and a half stars, but he only has room enough to note it's a "Broad slapstick comedy about ice-cream vendor Carson, who stumbles into a crime ring. Written by Frank Tashlin." And he's correct, of course. But. Whereas Jack Carson's Biff is the amiable and well-meaning (if not quite bright) Good Humor Man of the title, he's also the adult overseeing the neighborhood's "Captain Marvel Club." And it's the kids of the club who unite to lend a hand at the stunt-packed climax. Maggie, by chance I did watch it, and it was life-changing! Fell asleep after a long day and woke up for the end of Mr Hulot's Holiday. 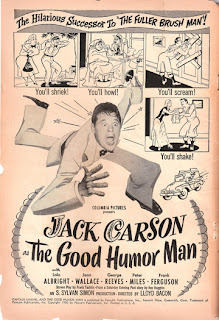 Was still awake for Robert Osborne's introduction and thought I'd give the Good Humor Man a shot since I like Jack Parsons and Frank Tashlin. And once they got to the Captain Marvel fan club, I was hooked! Wonderful confluence of comics and film obscurities, even if the birds were chirping by the time the film ended! One other thing which makes this an interesting movie for comic book fans: The bad guy is played by George Reeves who, of course, would soon be seen on TV screens everywhere as Captain Marvel's greatest rival, Superman! If a writer had put that in a story beforehand, I don't think any editor would've accepted it as believable.